A quick reminder about gauging NFL mock drafts three months out before the actual fun in late April: Focus more on the position than the player. Public draft boards remain fluid and will remain in this flexible state for several weeks before hardening in early March after the Combine. Compared to pro scouts and front office personnel, outside analysts are always behind the curve. Opinions change once sources share internal projections and rumors spread. There is also more time for homework on a concentrated batch rather than all of college football. Alabama safety Deionte Thompson lived in the top 10 before the college football playoffs. Two games later, mock drafters dropped him into the 20's after struggles against Oklahoma and Clemson. Kentucky edge rusher Josh Allen, Oklahoma guard Cody Ford, Kansas State offensive lineman Dalton Risner and Alabama running back Josh Jacobs are among the prospects positively trending. Team needs, however, remain stable for weeks, outside of the rogue trade or contract extension. Clubs are not permitted to enter into contract negotiations with unrestricted free agents until March 11. With the knowledge of strengths and weaknesses, study how many players at a position of interest are mocked with a general range of your team's selection. This is more important for now than a specific prospect at a precise draft slot. 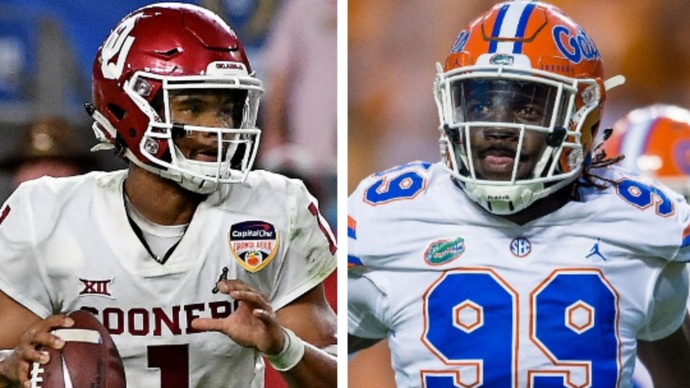 Now, it wouldn't be kosher to put entire mock drafts from other entities on our site (Click here for my latest full two-round mock draft). Instead, here's a sampling of what football thinkers are envisioning for the Redskins in the first round. We have a trade. CBS moves the Redskins to the Green Bay's selection at 12, while USA Today jumps Washington all the way to nine via Buffalo. Both scenarios have Washington selecting a Heisman Trophy-winning quarterback reared in the Big 12 Conference. Apologies for the Robert Griffin III flashbacks. As discussed here, the Redskins may at least need to jump Denver at 10 and Miami at 13 for a passer, assuming Murray or Ohio State's Dwayne Haskins slip past the Giants (6) and Jaguars (7). Analyst Daniel Jeremiah states Brown, a true speed threat, makes for a "tempting" option assuming Washington sorts out its quarterback situation. PFF's Steve Palazzolo writes Washington "needs to replenish their receiving corps and Arcega-Whiteside has one of the best combinations of body control and contested-catch skills in the draft." All fair points, but consider me a tad dubious about the Redskins going with a pass catcher at 15. The Redskins certainly need receiver help and more offensive playmakers overall. Adding a veteran ready to help meshes more with a coaching staff and perhaps front office likely putting more of a premium on immediate success after missing the playoffs for a third consecutive season. If slot target Jamison Crowder re-signs, that may eat up any remaining dollars directed for a receiver. Mel Kiper Jr. sends an edge rusher to Ashburn, specifically Florida's Jachai Polite, who finished with 11 sacks this season. This need races to the top of Washington's list should the team move on from free agent Preston Smith, and does not believe 2017 second-round pick Ryan Anderson can handle the gig. "There are a number areas Washington could address with the No. 15 pick," writes Dan Kadar. "Cornerback is one of them, and Murphy is pro-ready corner thanks to his instincts and ability to play the ball in the air." The Redskins could not really justify a corner in the first round if Josh Norman stays. Now, should they decide the high-priced defender provides more value as a salary cap casualty, then corner becomes a screaming need. It also looks like there will be a handful of corners potentially around on Day 2, including Clemson's Trayvon Mullen.